I love reading and watching mysteries. My husband jokingly refers to the many TV shows I watch as “your shows where people get murdered”, but I think there is something satisfying about trying to puzzle out whodunnit and seeing the guilty party caught and justice served at the end. If it is a mystery series, I’ve probably given at least one or two of its episodes a try. For this post I decided to discuss three of my current favorites that are from three different countries, but all based on book series: Murdoch Mysteries (or The Artful Detective) from Canada, Miss Fisher’s Murder Mysteries from Australia, and Bones from the United States. You can borrow the TV series and the books they are based on from BCCLS libraries. The Murdoch Mysteries are based on the Detective Murdoch series by Canadian author, Maureen Jennings. I first watched some of the episodes on the Ovation network where it was shown under the title The Artful Detective. 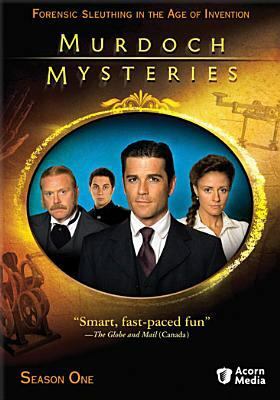 The series takes place at the turn of the last century in Toronto and focuses on the policeman and amateur inventor William Murdoch played by Yannick Bisson. Murdoch has a keen interest in science and he often rigs up contraptions like lie detectors that look forward to our modern technology. This has led to the show sometimes being labelled “steampunk,” but I think that can be misleading since steampunk is often set in an alternate world with greater anachronisms and more fanciful depictions of clothing and technology than are found in the series. Think more Victorian MacGyver and less gears and goggles. The show does highlight how that time period was a turning point socially and technologically into the 20th century. The character of Coroner Doctor Julia Ogden, played by Hélène Joy, provides not only a love interest for Murdoch, but also a strong female character that must fight the limitations put on her by the Victorian era. I also enjoy the comic relief provided by Jonny Harris’s bumbling but good-hearted Constable George Crabtree. The series just finished its seventh season and has been renewed for an eighth season. The first six seasons are currently available on DVD from BCCLS libraries. 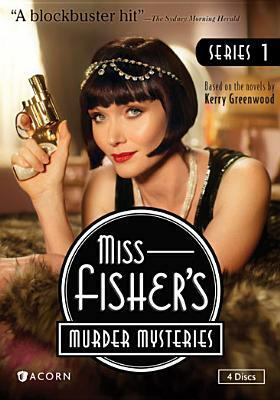 I was thrilled when I learned one of my favorite books series, Phryne Fisher Mysteries by Kerry Greenwood, had been adapted as a television series. You may remember Librarian Rosary Van Ingen had written about one of the books in the series in a previous blog. I couldn’t wait to be able to view the TV show here in the United States. The books center on Phryne Fisher, a very modern female detective, and her friends and family in 1928 Australia. The adaptation changes a few things from the book; there is no Mrs. Butler and so far in season one only Jane has made an appearance as Phryne’s adopted daughter. However Essie Davis (best known for her roles in The Matrix sequels) brings Phryne dramatically to life and the spirit of the show is definitely captured in a way that should satisfy fans. Although many of the episodes in the first season adapt specific stories from the books (including one of my favorites Blood and Circuses), an intriguing storyline about the childhood murder of Phryne’s sister has also been added that connects several episodes. The first season is available on DVD from BCCLS libraries and the second season was released in the United States on May 27. 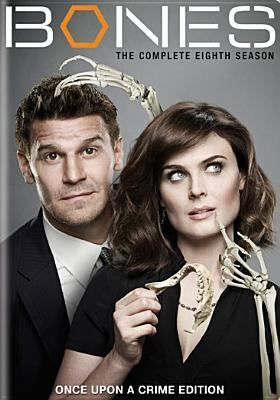 Bones focuses primarily on the partnership between The Jeffersonian Institute’s (a fictionalized Smithsonian) Dr. Temperance Brennan aka “Bones” (Emily Deschanel) and FBI Special Agent Seeley Booth (David Boreanaz) as they solve crimes from the skeletal, often at first unidentified, remains. Forensic Anthropologist Kathy Reichs’s crime series about Temperance Brennan has been one of my mom’s favorites, and I was a fan of David Boreanaz from his work on Angel so I was eager to check out Bones when it debuted in 2005. The crime scenes can be a bit grisly at times, but overall the tone has a gentle dark humor that keeps it from being too macabre. The show just finished its 9th season and will be entering its 10th season next year. I have had other TV shows lose my interests after much less time, but the cases continue to be interesting and the friendship between Bones and the other cast members continues to be captivating. The show also avoided the “Moonlighting curse” and has successfully transitioned from the romantic tension between Seeley and Bones to the drama from their being a couple raising a child. The show also allowed two of my favorite characters, and colleagues and friends of Brennan, T. J. Thyne’s Dr. Jack Hodgins, a bug expert, and Michaela Conlin’s Angela Montenegro, a forensic artist, to find love together as well. You may recall from a previous blog I mentioned John Francis Daley’s role as an often hazed newbie chef on the short lived Kitchen Confidential; starting in season three, he is equally charming as psychologist Dr. Lance Sweets. The first eight seasons are available on DVD from BCCLS. I’ve recently started watching the Murdoch Mysteries and I have to say there are identical storylines between this show and Bones. Season 7 especially.